The two initial LP releases from Countess proved to be messy, unhinged black metal efforts that found the band becoming stronger with the fewer members that were present. Ultimately the sole survivor ended up being Orlok, who is still releasing material under Countess to this day. By the time Ad Maiorem Sathanae Gloriam came along in 1995, the former band had now turned into a one man project and Orlok was performing each instrument by himself in the studio. Let's journey onward through the mythical procession of the Countess discography. Without a doubt, Ad Maiorem Sathanae Gloriam is both the most atmospheric and best performed of the original trilogy of Countess releases. When most of the black metal acts were heading in the same direction at this time with compositions that were slowly separating from their punk roots and ties to bands like Hellhammer and Mayhem, Orlok was doing his own thing; be it good or bad, that's ultimately up to the taste of the listener. While this release still features seemingly signature elongated and repetitive riffs, for their time they're still unique to black metal and are surprisingly catchy despite their grinding nature. Vocals aside, none of the typical genre elements are present, such as tremolo picking, high treble tones, blast beats or fast tempos; everything is done at a slow to medium-slow pace and is comprised in majority of power riffs on a guitar that has a bassy medium-treble tone with tame backing drum patterns that follow chord changes. On the first listen, one may not find anything particularly interesting or striking about this release but the idea that this album is quite possibly one of, if not the first, primitive conceptions of depressive black metal immediately makes a difference in how this content is perceived. Orlok includes a lot of early doom elements in this content, for instance within "The Wrath of Satan's Whore", "Blood On My Lips" and the Saint Vitus cover "Born Too Late". There are tons of keyboard inclusions throughout the album that enhances the present forlorn atmosphere with tolling bells, creepy organs and obscure sound effects, most notable in both of the title tracks and "Thus Spoke the Master". While the lyrics are filled with one-part references to Countess Bathory and three-parts Satan worship, his vocals are filled with anguish and regret as he belts out his wraith-like shrieks throughout each track, occasionally breaking away into clean spoken word segments when appropriate. The other portion of the guitar make up is that of exceedingly simplified slow leads that further push the depressive aura of the content. While on one hand Ad Maiorem Sathanae Gloriam can be incredibly stale and irritating due to bouts of repetitive riffing and stagnant compositions, on the other hand it's a unique effort for its time that just hasn't held up well over the years. 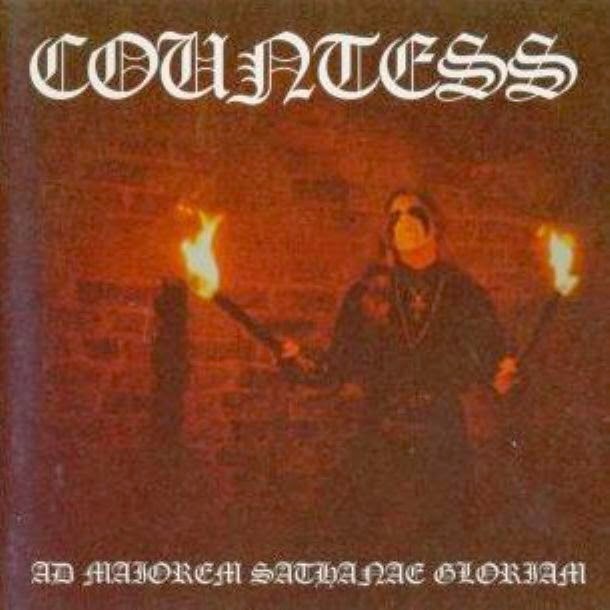 The material undoubtedly has helped to pave the way for ensuing depressive black metal acts, but it isn't one of the stronger entries in the Countess discography. Tracks "The Wrath of Satan's Whore", "Thus Spoke the Master" and "Ad Maiorem Sathanae Gloriam" will make you think otherwise, however the rest of the material is little more than repetitive grinding.